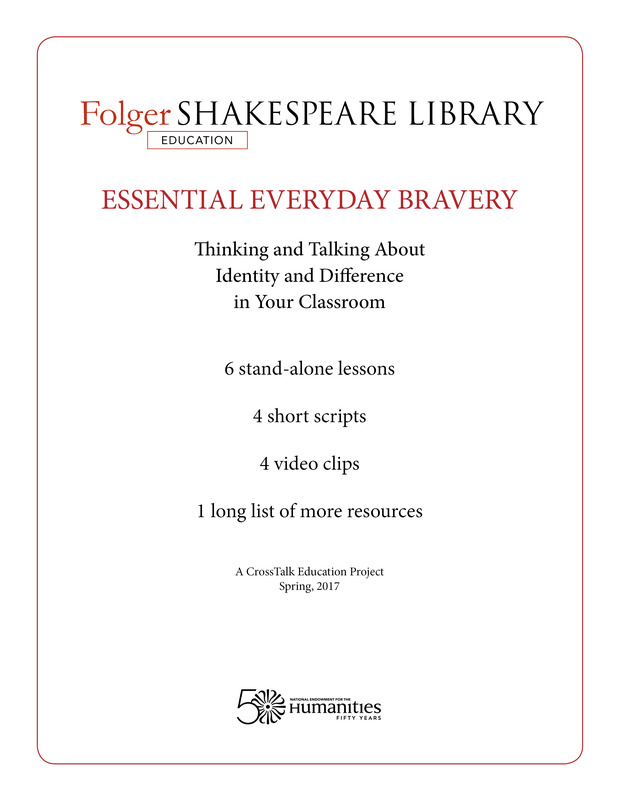 Editor’s Note: This school year, we are highlighting individual lessons from our CrossTalk education project, Essential Everyday Bravery: Thinking and Talking about Identity and Difference in Your Classroom. To learn more, check out the CrossTalk webpage. Earlier we featured a lesson by Baltimore teacher Amber Phelps, who gets students thinking deeply about identity and vulnerability through asides in two plays: William Shakespeare’s The Merchant of Venice and Aaron Posner’s District Merchants. 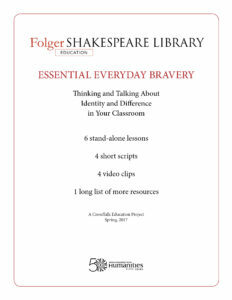 In this lesson, her colleague gets students creating their own inner monologues. To access the resources mentioned in this lesson—and to download the complete packet of CrossTalk lessons—go here. Students will analyze the impact of a character speaking a monologue that only the audience can hear, focusing on how and why a play wright includes an inner monologue in a play. After analysis of the inner monologue in District Merchants, students will create their own, based upon cultural misunderstandings. Teachers should pass out the Scene 4 script (District Merchants 1.4) and have students read the scene out loud, in pairs. Why does Nessa choose to speak to the audience rather than the other character onstage? Describe the issues that make the speech too uncomfortable to deliver to the other person. Underline words and punctuation that make the speech seem conversational. What punctuation is used? What kinds of words and sentence structures are used? Note how the playwright shifts between the “real” scene and the inner monologue. What would you like to say to your parent or teacher while you are being scolded? What would you like to say to a romantic interest you are too afraid to ask on a date? What would you like to say to someone who you need something from, but is rude to you (such as a classmate in a group project, or a repair man who will fix your phone inexpensively)? The teacher will shift the discussion to talking about culture, and what cultural barriers compel Nessa to address the audience rather than Portia. For example, What would you like to say to someone of a different race, culture, religion, or age group who might not understand what you are going through? The teacher tells students to continue to brainstorm ideas for what situation an inner monologue would be especially relevant, and, at the same time, to think about what the other person on stage might be feeling at that moment, too. After completing the inner monologues, the class will complete (perhaps volunteer) staged readings of the scenes. ■ Did students analyze how District Merchants’ playwright (Aaron Posner) incorporates internal monologues and why? ■ Were the students able to examine several examples of instances in which an internal monologue might happen, and then extend that into discussing how cultural differences can bring this about too? ■ Were students engaged in the writing of their own scene with internal monologues, and do the monologues reveal truths that wouldn’t otherwise be expressed? ■ Differentiation: students with learning disabilities can have a modified assignment with only one internal monologue. ■ An extension might be to extend the scene into a full one-act play. ■ Students can be encouraged to perform their scenes to different cultural groups at school. Mark Miazga has taught English and coached baseball at Baltimore City College High School, the third oldest public high school in the country, for 17 years. The 2015 Milken Educator Award winner for Maryland, he currently teaches IB English IV (12th grade), IB English I (9th grade), and IB Drama II (10th grade). Mr. Miazga was a 2008 Teaching Shakespeare Institute scholar, a 2013 Steinbeck Institute scholar.